KAGONIN is a new collectible card game created by Erik DePrince & Jessica Volinski and printed on-demand by TheGameCrafter.com. If you're new to KAGONIN, the Complete Prime Set is where it all begins. 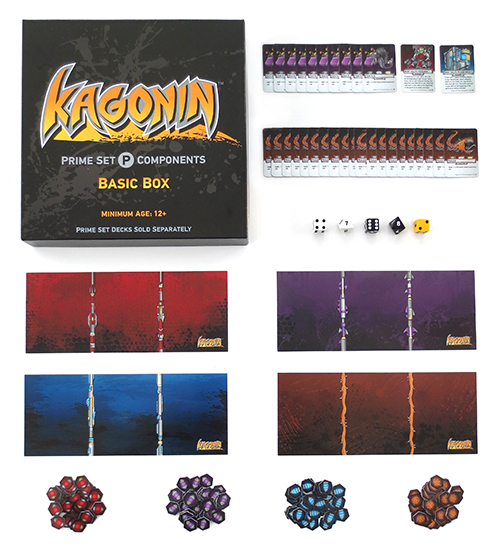 With 5 parts including the Prime Set Components Box (Deluxe or Basic) and 4 Prime Set Decks, The Prime Set is the foundation of KAGONIN. With many components and 234 total full size cards, the Prime Set has everything you need to to build and play your own awesome KAGONIN decks. As a print-on-demand game, each game is printed to order and will be sent to you directly from TheGameCrafter. Their quality is outstanding. Shipping may take a bit longer than you're used to when ordering a traditionally produced game (about a week to 10 days, depending on where your order falls in their queue), but we think you'll agree its well worth the short wait. The print-on-demand model not only allows us to give you guys new products much more frequently than we could with traditional printing, but it also allows us to offer special cards in smaller, more limited quantities that would never be economically possible with larger scale manufacturing. With such a short distance between creating new cards to getting them in your hands, the creative possibilities for KAGONIN truely are endless. And the Prime Set is just the beginning. We understand the greater the variety of cards players have to build decks with the better so expect to see single cards, limited edition cards, expansion packs, promotional fan cards, and more coming very soon. NEW! We are now offering both a DELUXE ($54.99) and BASIC ($25.99) Components Box. The Deluxe has some extras such as the printed rulebook, more charge counters, additional dice, drawstring bags, a multicolor battle board, and the X cards pack that you cannot get in the Basic Box, but the Basic Box has all the essentials you need to get playing. Choose the one that works best for you. PLEASE NOTE: These 4 Exclusive cards are ONLY available during 2014-2015 and can ONLY be bought in the Prime Components Box. Each of the 4 decks (Parts 2-5 of the Prime Set) are sold separately from the Prime Components Box (Part 1). THE UNOPENED COMPLETE PRIME SET- 4 DECKS PLUS THE DELUXE COMPONENTS BOX SHOWN. EACH BOX SOLD SEPARATELY. SEE HOW KAGONIN IS PLAYED! Please note: This rulebook does not contain the WORLD OF KAGONIN story which is only available in the printed rulebook that comes in the Prime Components Box.